Where Do Telemetry Nurses Work? What Is a Telemetry Nurse? The telemetry nurse specializes in caring for patients with heart disease, complications of heart disease and/or heart failure, or other medical issues which require continuous telemetry monitoring. This also includes caring for patients who are recovering from cardiac intervention, such as a cardiac stent or coronary artery bypass grafting (CABG) surgery. It's important to note that this type of nurse does not work in the Cardiac Care Unit, which is a type of ICU which cares for cardiac patients. The patient on the telemetry floor has often transferred from the ICU and is now considered stable, but requires close monitoring. Registered nurses who want to become telemetry nurses will have to complete some additional training. First, they will need to learn how to use an electrocardiogram (ECG, EKG) machine to monitor a patient's heart and assist the doctor in diagnosing abnormalities. They will also need advanced cardiac life support (ACLS) training to be able to react in the event of a patient's cardiac arrest. These courses can usually be found at local community colleges if a nurse did not take them during nursing school. What Are the Education Requirements for Telemetry Nurses? Registered nurses who have passed the NCLEX-RN can work as telemetry nurses in most hospitals. Nurses who hold an ADN or BSN are both eligible. Keep in mind, however, that many hospitals are trending toward exclusively hiring BSN-educated nurses. While this may not be a requirement currently, nurses are encouraged to further their education as there may come a day where a BSN is mandatory. The Academy of Medical-Surgical Nurses (AMSN) offers a certification for med-surg nurses who care for patients with telemetry monitoring. The American Association for Critical Care Nurses (AACN) offers 2 sub-specialty certifications for telemetry nurses who are certified already with a nationally accredited clinical nursing specialty. Telemetry nurses typically work in a hospital setting. They care for patients who are out of the ICU, but need their vital signs monitored closely (after surgery, for example). There is usually a telemetry unit or a "step-down" unit for such situations, and these are places where a telemetry nurse tends to practice. Having excellent assessment skills and the ability to quickly apply knowledge is a main job requirement. Patients on the telemetry floor may deteriorate quickly and the nurse must respond appropriately. Aside from this, telemetry nurses can also find employment in clinics and certain outpatient facilities, and sometimes provide in-home care for patients that need to be monitored around the clock for clinical studies or other diagnostic reasons. 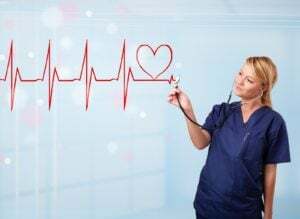 A telemetry nurse specializes in reading and monitoring the output of electrocardiograms (EKGs), which translate the heart's electrical impulses into a readable rhythm. The telemetry nurse is specially trained to detect dangerous changes in these rhythms and alert the doctor in charge. They also monitor other vital signs including blood pressure, oxygen level, and more. If an irregular heart rhythm is detected, telemetry nurses may assist with procedures such as cardioversions or treatments for other cardiac emergencies. What Are the Roles and Duties of a Telemetry Nurse? Monitors vital signs including oxygen levels, blood pressure, breathing patterns, etc. While many things, including location and education level, affect a nurse's wages, the median salary of a telemetry nurse is $58,500 with a range of $48,065 - $84,881. The job outlook for telemetry nurses remains strong, with jobs available due to a nursing shortage in general. The demand is high for telemetry nurses in particular because of the specialized training required to go into this niche area of registered nursing. With cardiac issues being one of the main health problems that Americans face, RNs looking to enter an in-demand specialty will find telemetry nursing a rewarding and stable career.